Before phone makers adopted modern design discipline, they meandered down a few other paths. NEW YORK ( TheStreet) -- Attractive phones are easy to find. Ever since Motorola's ( MMI - Get Report) Razr and, later, the Apple ( AAPL - Get Report) iPhone, manufacturers have had to work hard on pleasing designs. Gorgeous, giant glass fronts framed in elegant black, sleek steel or shiny chrome, smartphones pack brains and beauty. But not always. Before the mobile phone industry got all busy with design makeovers and tummy tucks, there were -- and still are -- some delightfully hideous phones that represented the other side of the beauty trend. TheStreet has gone back through the past decade to dig up some of the best examples of designs that make you wince and stare in disbelief. The clueless stylings, the flights of fancy into odd shapes, the obsession with square versus rounded -- it is a wonderfully colorful history. >>To get our tech coverage on the go, try TheStreet iPad app. Here are 13 of the ugliest phones ever in this century. And since beauty and its antithesis is in the eye of the beholder, please send names and photos of your favorite uglies to uglyphones@thestreet.com. Please note that these photos should be ones you take yourself. By sending us your pictures, you represent that you own or otherwise have the intellectual property rights to submit them and that you automatically grant TheStreet the non-exclusive right and license to modify and publish the photos. Please see the full disclaimer here. When submitting the photos, you must acknowledge that you have read the disclaimer. Lastly, please include your name, hometown and a description of the picture (if you don't want your name published, please say so). Folding phones offer a compact and winning design. Samsung's SGH X800 got the folding part right, but it missed on the compact part. Open the phone was fine, but folded? It was like a fat little hand grenade. Like the Samsung hand grenade, the LG VX8300 was a lot of hardware all folded together. A camera, music buttons, an external screen, twin side speakers and an antenna that Verizon ( VZ - Get Report) required at that time -- the LG VX8300 had a lot going on. You can sort of see how the clutter made Motorola's follow-up with the clean, ultra-slim Razr so popular. Palm, now a division of HP ( HPQ, arguably invented the smartphone. But the signs of Palm's eventual demise were evident with this later generation Treo. While its contemporaries were slimming their designs, Palm's Treo 700 arrived not only thicker but heavier than its Treo 600 predecessor. Two big speakers inside LG's horizontal flip phone didn't really compensate for the two puny display screens. LG, which had a decent track record with phones, apparently put aside its talents and let Verizon take over the design decisions. The VX9800 was intended to be a big vehicle for Verizon's VCast media offerings. Any wonder why Apple wouldn't play ball with Verizon all those years? Before HTC made sleek black phones, they cranked out clumsy, silver bricks like the Apache. The Apache was part of a pioneering smartphone effort by Sprint ( S, Microsoft ( MSFT - Get Report) and HTC. The phone was hot, but not in a good way. And it was pocket-straining heavy. Let's just say HTC has done well not to follow the silver brick road. Teen phones are a questionable move by any company, but ugly teen phones like Microsoft's Kin beg the question: What were they thinking? At least the Sidekick, the Danger-made predecessor to the Kin, had a cool look. The boxy shape of the Kin almost assured Microsoft's phone failure. It only took two months of sales for Microsoft to kill the Kin. Is there a demon whispering "make it square" in the ear of phone designers? Even the new Motorola couldn't resist the temptation. The Flipout, launched earlier this year, brings a whole new approach to square with its interesting corner hinge. Foxy? No. Weirdly boxy? Oh yes. Police-tape yellow and shaped a lot like a firefighter's walkie-talkie, the Motorola Nextel i500 wasn't trying to be one of your pretty phones. It was aimed at first- responders of business. Tech crews and workers out in the field needed a rugged-looking phone on their belt; the i500 was the perfect accessory. It was a radical move by Sony ( SNE Ericsson ( ERIC with the T61z phone. Do people want corners or curves? Let's give them both. Sony Ericsson made the T61z square on the bottom and oval on top. Brilliant. Who wouldn't like a phone shaped like a shoe-print? Not to be outdone by those pesky Swedes, Finnish phone giant Nokia ( NOK - Get Report) totally turned the tables on the Sony Ericsson T61z and made the 3620 with an oval bottom and a square top. Take that Ericsson. Business folk cherished this squat, homely little phone. Who cared that it was pudgy and unapologetically plastic? One redeeming feature was the thumb wheel, which allowed hard-chargers to scroll through emails with one hand and, you know, master the universe with the other. Ah yes, the "lady" phone. The Samsung Cleo really hit the mark with this one. Pink is bad enough, but does square really speak to the female phone buyer? What a cute, ah ... cigarette case? um ... makeup compact? Oh, look at that, it's a phone! Ladies and gentlemen, we have a winner. 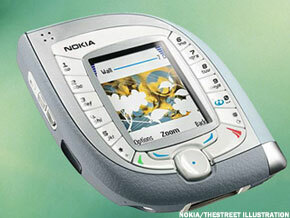 While Apple was changing the phone industry with a super-slim touchscreen iPhone in 2007, Nokia came out with this gem. It's not clear what inspired the small screen and the pig's ear shape, but it gets top honors in this contest. Any wonder why Apple is cleaning up in mobile, while Nokia is clearing out.